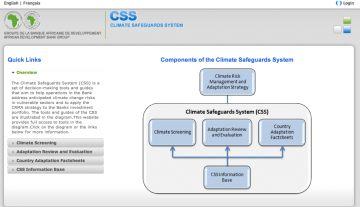 The African Development Bank, under a contract with the Global Climate Adaptation Partnership, is developing a Climate Safeguards System (CSS) as a set of decision-making tools and guides that enable the Bank to screen projects in vulnerable sectors for climate change risks and identify appropriate adaptation measures to reduce vulnerability. The system delivers on a key objective of the Climate Risk Management and Adaptation strategy (CRMA) and Climate Change Action Plan (CCAP), which is to mainstream climate screening and adaptation in Bank projects. Module 4: CSS Information Base: the Information Base contains a portal that gives direct access to the climate projections developed for African Countries by the University of Cape Town; it also contains a database of adaptation activities and links to a wide range of information sources on adaptation; it provides information required for use of the modules described above. Lots of work on monitoring and assessing adaptation out there, what exactly are you looking for?